Corrupt Exchange Server Database? Priv1.edb file gets inaccessible? Need to move Exchange Mailbox to PST? Try Enstella Export EDB to PST tool and easily move exchange mailbox to PST mailbox with all of Exchange elements. Enstella Export EDB to PST software fastly read exchange database and effectively migrate exchange database to PST database. * Non-database files or corrupted database. 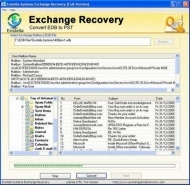 Enstella Export EDB to PST tool - Exchange EDB recovery software specially designed to repair corrupt exchange database to a Personal Storage (.PST) file that can be easily used with MS Outlook. Enstella Export EDB to PST tool skilfully Convert EDB to PST with all emails, attachment, calendar, contacts, tasks, notes, journals, appointments etc. It is an EDB Extraction tool that facilitates Unicode EDB file recovery and restore mailboxes in *.pst files. Free EDB to PST converter demo version available on our website http://www.exportedbtopst.com; download and try on your corrupt or inaccessible Priv1.edb file and test it at your own satisfaction. If you full satisfied with free demo version software, Purchase the licensed version of Enstella Export EDB to PST software at 299USD and migrate exchange database to PST database. Now users can Transfer DBX to Windows Live Mail using DBX to Windows Live Mail Converter Tool with high quality features. Kernel for Exchange Server is an efficient EDB file recovery tool that repairs corrupt EDB files and then allows you to send them to Office 365, live Exchange Server or to Outlook PST files in one cycle. EDB to PST Converter Software helps to repair EDB File and convert EDB to PST File within seconds. EDB Converter Software supports selective EDB conversion process and safely restore EDB file to PST Outlook file.